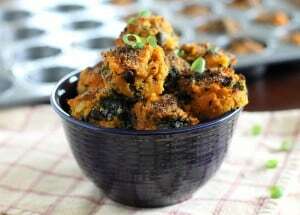 These sweet potato kale bites are like mini muffins of sweet potato, kale and black beans. They’re a great make ahead side dish to have on hand. Currently, my fridge is like that closet you never use in your house and shove every random item that needs to be stored in and then fear for your life when opening it not knowing what random thing is going to fall on your head. Except, it’s my fridge and I open it approximately 136 times a day not twice a year. There were no less than 3 fallen tupperware containers yesterday alone. Prepping large amounts of food ahead of time is kind of a blessing and a curse like that. I love having healthy stuff on hand but not so much the container of black bean quinoa hitting my foot and bouncing across the kitchen floor. These are the newest added danger to the fridge assortment. 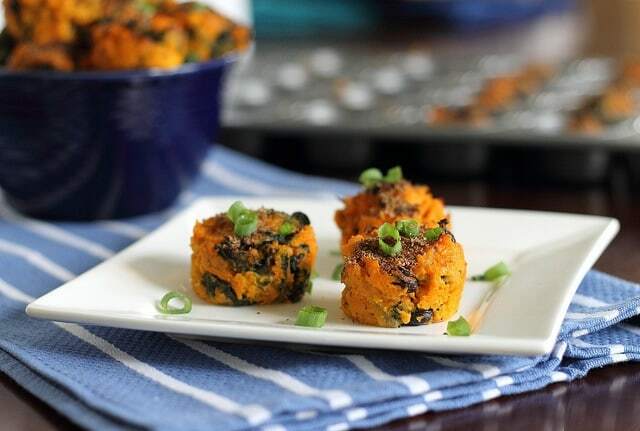 Sweet potato “bites” stuffed with kale and black beans. I have two categories of bookmarked stuff. Stuff that is a great idea, file it for later or when I’m in the mood for it (that list is incredibly long) and stuff that absolutely must be made now. These fell into the latter category after seeing Ashley’s salt & vinegar potatoes. While I love the salt & vinegar combo, I didn’t think it would work as well with sweet potatoes and that’s all I had on hand. So, I switched it up a bit because I knew they would be a great healthy starch to have for the entire week and leave one less thing to decide upon when putting a quick midday meal together. I’ve definitely noticed my creativity with meals decreasing now that I’m eating 5-6 a day. I just don’t have the energy or time to think of fun new ideas each and every time. Cooking and baking in bulk has become my saving grace. These have literally been on my plate 5 out of the last 8 meals. Perfectly sized, sweet with a crunchy top and stuffed with greens. Doesn’t get much better than that for a quick and easy side dish. These sweet potato kale bites are like mini muffins of sweet potato, kale and black beans. They're a great make ahead side dish to have on hand. Bring a large pot of water to a boil. Boil cubed potatoes for about 15 minutes until fork tender. Drain potatoes and mash them in a large bowl with milk. Add olive oil, garlic, onion and red pepper and saute for about 1 minute. Add kale and saute until wilted. Once kale is wilted, add to the bowl with sweet potatoes. Season liberally with salt & pepper to taste. Fold in black beans until incorporated. Grease a mini muffin pan. Scoop potato mixture into a mini muffin tray until filled to the top. Sprinkle tops with ground flax seed. Bake for 20-25 minutes, turn oven to hi-broil and broil for an additional 5 minutes until tops are golden and crunchy. Carefully remove from muffin tin with the help of a spoon or knife. Bites will be soft but should retain enough structure to stay in mini muffin form. I suggest reheating in a toaster oven rather than the microwave if you want to retain some crunch to the muffins. Making this tonight! Love the recipe!!! I love your spins on sweet potatoes, I just bake them and eat them, but you always make it a few notches up! I love it!!!! I’ve got one lone sweet potato in there just begging to be used. Score! Yummy! I love the sweet potato and kale combo. Oh man. Making this for lunch! When I read the first part about the closet you shove everything into, I thought of the Friends episode with Monica’s hallway closet. I’m pretty sure everything in life can in one way or another be related back to that show. I LOVE IT. Moving on, these sounds absolutely delicious and packed with so many nutrients! Yummy! ohhh yes, sweet pot + kale are just perfection. I eat that combo daily for the most part. I agree with the creativity of meals for me… I’ve been lagging and not very inspired with my lack of time lately. Hoping that next week when my schedule opens up to get back in the kitchen. Oh my LORD I would snarf these up in three seconds! I have been waiting for this post after your WIAW. I love everything about these… Mashed sweet potatoes with kale and then instead of getting deep fried, they’re baked. Super healthy and delicious. Oh Gina! I love you, this is what I am making for dinner tonight. haha, thanks. :) Hope you enjoy them! I found your site through another blog and can’t wait to see what your next post will be! Mmm – I would never be able to stop popping those little guys into my mouth! Ooo this looks awesome, must make it. But I don’t have a mini-muffin tin… should I just bake for an addition 5-10 mins? Yeah you could definitely use a normal muffin tin. It might be a few minutes longer than 5-10…just keep checking them. It’s hard to tell b/c they “set” when they’re cooling but it’d be hard to overcook these, they’re mashed potatoes! Gina, these are out of this world. I want them for breakfast. Love the combo of flavors! My word!! Get those in my belly now! They would be on my plate for 5 out of the last 8 meals if I had them laying around, too! 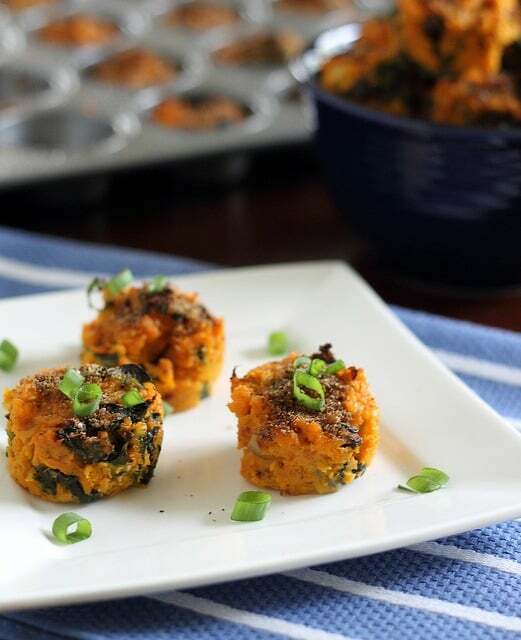 I love all things kale and sweet potato and these look bites look so good. I’ll definitely have to make them soon. Can we be friends? No seriously…I know we live on polar opposite sides of the country, but we could hang. Sweet potato and kale is literally a combo I have every day. It never gets old….and it’s SO good for you! I’ve enjoyed reading about your workouts and your nutritious recipes are always tons of fun! looks awesome, as always!! sweet potatoes are like my best friend. LOVE them! I am loving sweet potato and kale lately. I’ve made sweet potato kale pizza and kale stuffed sweet potatoes. This looks awesome. ok, the second i saw this, i knew this was going to be phenomenal. i love the ingredients in this and they’re so healthy!! no guilt at all eating these balls! I love black beans and sweet potato together. I can’t wait to try these! My fridge, freezer, and cabinets are the same way!! I actually broke the 2 weeks ago fridge because it was so full….I was embarrassed to put in that work order with our landlord. Oh My Goodness! YES!! I will definitely be making these ASAP. So many of my most favorite things together in one bite? Sounds like heaven. Loving this recipe. Thanks for sharing. Seriously though these are freaking adorable! and look soooo gooood! This looks outstanding. Do you have any nutrition amounts for this? I journal on My Fitness Pal and would like to know calories, etc. :) I’m excited to try this soon! Thanks! Hi Lisa, I don’t actually. But I’ve used the nutritional calculator on sparkpeople before and it’s pretty easy to plug the ingredients in and find out! Love your spin on these!! ABSOLUTELY LOVE THIS! Can’t wait to give them a try! Tupperware is the adult version of Jenga. I want these immeeeeeediately! If you had to sub out the black beans for something else, what would you do? Thanks! You could probably sub out any other bean you like. If you’re not into beans, someone said they made them without and they turned out fine too :) Just increase the kale a bit maybe? i made these last night – did you use a smaller than usual muffin pan? mine look bigger (i used a standard muffin pan) than yours in the pic. they taste good – i just wish they were a little more set. they hold their shape by like 25%. maybe the size of mine causes a prob? Hi Kim- I did use a mini-muffin pan like it says in the recipe. It definitely helps them keep their shape more when they’re smaller. If you look at the previous comment from Iris, she asked the same thing about using a normal pan and my suggestion was to cook them a little longer to try and help them shape up more but I think the mini-muffin pan is your best bet if you have one! These are delicious! I made a half batch just to try them, and I ate all of them by the end of the day. Sweet and savory, nice texture, hold together well after cooked. I will be making them regularly. These look really good. I love that there’s black beans in there. Seriously 3 of my favorite foods: black beans, kale, and sweet potatoes. YUM! Any tips on how to make them paleo (i.e. bean-free)? I’d just omit the beans and replace it with something that’s paleo. Maybe raisins? Haven’t tried it, but I’m sure it’s flexible enough for substitutions. I think I am going to make these to take on a roadtrip. Last year a friend and I packed a cooler with semi-healthy food for a 4 day trip to the Black Hills and we only ate out once a day. Saved money and didn’t gain any weight on our trip. Planning the same trip this year and have been checking out different recipes and this looks perfect. Amazing! Perfect little bite with a pack of protein! These look amazing, I cooking this tonight…. awesome :) So glad you guys liked it! Found the recipe on Yummly and decided to make it today but found out that I did not have any black beans, I sub creamy corn did use a lot it came out okay just have to here what my friends think of the corn taste. Maybe a I will sub raisins as I am not a black bean fan.